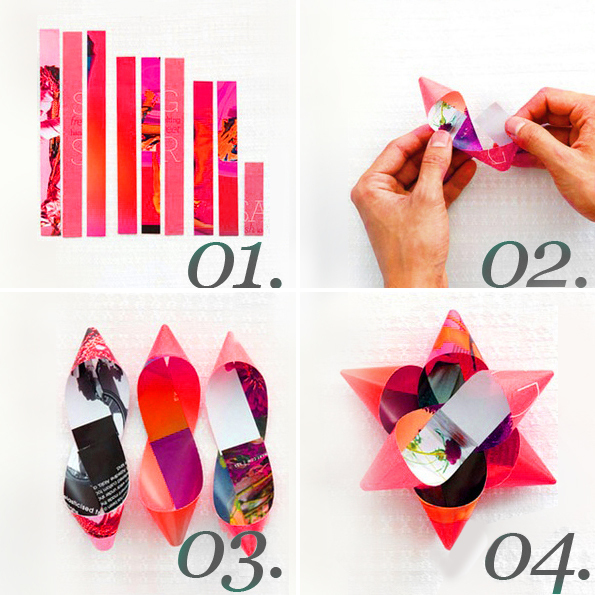 Mother's day is coming up and what better way to read, wrap and upcycle! Colourful magazine pages make unique wrapping paper for small gifts! I ripped 2 x pages from a magazine, folded the long edge (the ripped side) of both, and taped them together to make an A3.You can also turn old magazine pages into beautiful, one-of-a-kind bows for your pressies. Diagram above by Martha Stewart. You'll need a page per bow and some double-sided tape. Three x 20cm (7.8"), three x 18cm (7"), two x 15cm (6"), and one x 6cm (2.3"). 2. Twist each strip to form loops at both ends. Make a circle out of the smallest. 3. Secure the ends with a piece of double-sided tape. 4. Layer and stick, starting with the longest strips. End with the circle in the center and double sided tape to stick onto gift!